Come and celebrate a moment in history at the Reality of a Dream Inaugural Black Tie Ball in the luxurious Washington Court Hotel. Indulge in Caribbean cuisine from the lavish buffet and take your spirits to new heights with the top shelf open bar. After you have drank and eaten to your merriment and delight, dance the night away to the pulsating sounds of Sweet Micky. Also, possibly shake the hand of our special invited guest Patrick Gaspard, the Political Director for the Obama Administration, mingle with the Presidents of Sierra Leone and Senegal, Ernest Bai Koroma and Abdoulaye Wade, respectively . 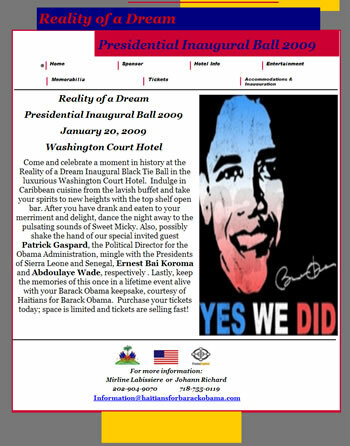 Lastly, keep the memories of this once in a lifetime event alive with your Barack Obama keepsake, courtesy of Haitians for Barack Obama. Purchase your tickets today; space is limited and tickets are selling fast!